Whether you need a solution for kitting and sub-assemblies, Brenner-Fiedler can be a key partner in streamlining your processes by providing solutions for your needs. These kits can derive from many components down to just a few and provided to you as one single part number so when it comes time to pull a bag or box off the shelf for your final product, it is accurate and ready to use. The sub-assemblies can help reduce the total production time you need to complete a larger scale project by having a portion of the assembly completed and tested for use so they arrive at your dock for final production. Here are a few examples of solutions we've provided over the years. 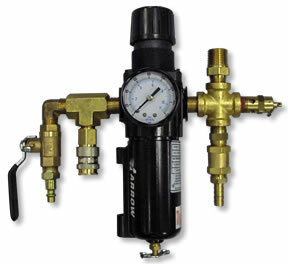 Challenge: The customer required both vacuum and pressure to run their tool correctly. Generally this would require a pump for each but they did not want to buy two pumps because of the cost and available amperage in the surrounding environment. Solution: The Gast RAA model pump is a two headed compressor or vacuum pump depending on the application and the way it is used. 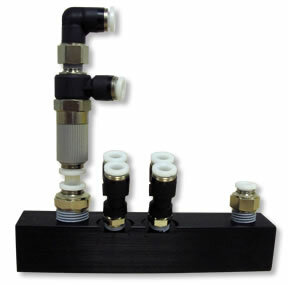 The heads are tied together with tubing to increase flow or vacuum levels depending on configuration. 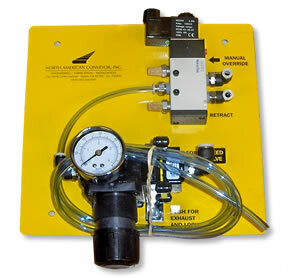 While the newer head design on the pump/compressor does not allow for port selection, the older design has six usable ports. We replaced the current two heads with the old style heads and configured each head to work independent of the other; one being set up for vacuum and the other for pressure. 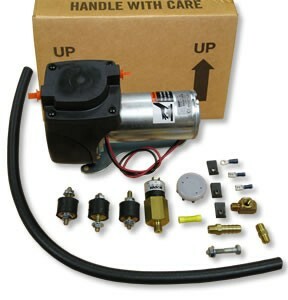 By doing this the customer essentially has two pumps running with one motor that falls in the range of available amperage and eliminates the need for a second pump. 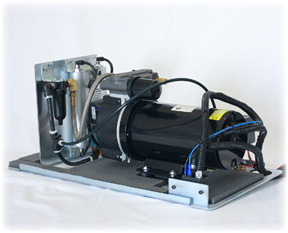 Challenge: Customer required a compressor system for buses that included over 40 different parts. At first they purchased a couple main components from Brenner-Fiedler. They then purchased over 40 additional parts from other vendors to assemble a complete system and then performed a final test to make sure the assembly met their specifications. Solution: Brenner-Fiedler offered a complete solution that is fully assembled and tested prior to shipment. The customer was able to place one purchase order instead of approximately 14 separate purchase orders that had to be tracked. The assembly saved them approximately 3 hours in labor, to receive the parts, put them away and pull them when needed. The assembly also eliminated any rejections they encountered after final assembly as everything is 100% tested prior to shipment. Challenge: An oil drilling company needed a storage tank for high pressure air used for a braking system on an offshore oil drilling rig. The tanks needed to hold up to salt, water & weather. 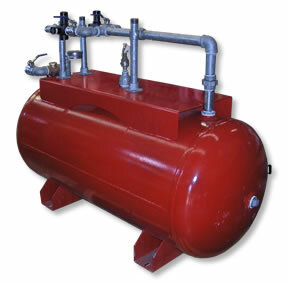 Solution: Brenner-Fiedler purchased a tank and had it specially coated internally & specially painted externally. Then, the piping, relief valve, ball valves & regulators were mounted, specially packaged and shipped. Challenge: Customer purchased slides for their conveyor systems. Every slide required the proper valuing and pressure to operate successfully. Customer needed a complete unit that would convey a professional image they wanted to project with their equipment plus ease of use. Solution: Brenner-Fiedler purchased the components and a mounting plate. The mounting plate was properly cut to customer’s specifications, powder-coated to the customer’s corporate color scheme and labeled according to customer’s instructions. Brenner-Fiedler then purchased and mounted all the necessary components and hardware. The result is a professional modular unit that replaced 40 individual components installed. When the customer orders this assembly, they receive a value package ready to mount. Challenge: Customer had a need for a filter regulator, ball valve, relief valve & many fittings. Combined, the customer purchased 13 individual SKU’s from 4 different vendors to fulfill his needs. They had to purchase parts separately, track inventory, follow up with vendors, plus store them in their warehouse. Customer was constantly dealing with lead time issues from different vendors. When it came time to use the parts, they had to pull the parts individually. Customer was looking to reduce man hours required and to cut costs. Solution: Brenner-Fiedler was able to purchase the components needed and configured a solution that mounted all the parts together in one unit. 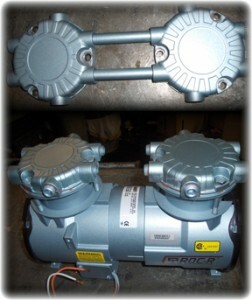 The customer received one unit ready to be used in their master assembly. By assigning the unit its own part #, purchasing requirements, stock & costs were reduced. The customer’s resources are now freed up to concentrate more on their core business. Challenge: Current customer required a kit of 60 components. 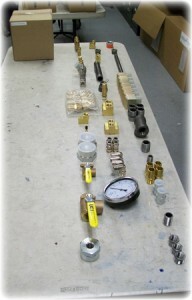 As we assembled the kits, we realized that the customer would be assembling many of these components at their facility. Solution: Working with the customer, Brenner-Fiedler identified the parts that would be assembled together and proposed several sub-assemblies that would make up the main kit. The result was a kit with one part number that had multiple sub-assemblies plus contained individual components needed to complete the final assembly. The customer to saves time and money on labor costs since the kits are pre-assembled when they receive them. Challenge: To gain more control and spend less time on inventoried parts for a Fittings and Accessory Kit. The kit has over 40 items which has to be purchased from several vendors (10+). And with the majority of items being from vendors who do not have a field salesrep to assist with any changes they might have. This required the engineering department to look for and spec in every part individually. One product or part change could cause several items to be changed, which could mean having to contact several vendors. Right now they have a shelf set-up for and inventory has to be tracked on all the items individually. The production department has always had issues of inventory not being complete and resulting in their production being held up on the machine. Solution: We have created a section in the warehouse with bin boxes for every different fitting, valve, adapter, connector, etc dedicated to not only this kit but for items that go on the same machine that are not in the kit. Each kit of parts fits in a small box that the customer easily pulls off their shelf and have every part needed to build that machine. The changes we helped implement positively impacted four different departments, if not more. We make it easier for their Engineering Department to change or choose parts, Purchasing Department has one part number and price for 40 line items, Production Department never being held up for parts, and their Inventory Department no longer has to track the individual items to ensure that they are in stock. Challenge: Customer manufactures replacement parts, custom products, and performance enhancement products for classic cars to hobby enthusiasts and classic car restorers. One product the customer offers is an aftermarket device for cars that is used as a “brake assist” for off-road diesel retro-fits. Customer purchased and warehoused 18 different components they assembled to make this special kit. They had to purchase parts separately, track inventory, follow up with vendors, plus store them in their warehouse. When it came time to use the parts, they had to pull the parts and assemble them in a kit for the end customer. Solution: Brenner Fiedler proposed to assemble the kits for the customer. We already stock the parts and order them on a regular basis so it made sense for us to assemble the kits for the customer. We customized a parts packing list and pack them in a custom labeled box. Packages arrive to the customer completely ready for distribution to the end user. The customer now has more time to concentrate on their core business, plus it freed up warehouse space and personnel time.